I knew when I purchased this Tilda holding Hatched Chick that I could put nearly anything in her hands... as long as it covered the original image. So I drew a little kitten for sweet Tilda to have and hold. I used two sheets of matching paper from The Glitter Stack by DCWV, matted with two sheets of purple and yellow Bazzil cardstock. All papers were edged with my Copic V09 marker. 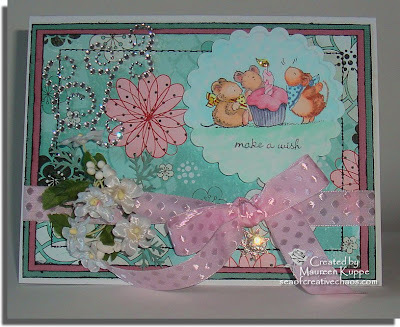 I used simple flower brads and ribbon from my stash. 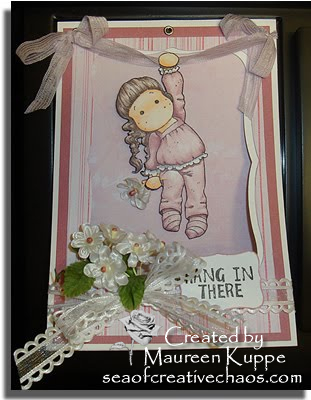 The sentiment is hand-written on a Cuttlebug punched tag, nested onto cardstock that was punched using my Martha Stewart lace edge punch. My Cuttlebug was also used to punch out the Spellbinder's oval mat as well. Both the oval mat and Tilda are raised on foam dimensionals too. So I drew Tilda's Daddy to guide her, and instead of a basket of peaches, made her a purse... perhaps Daddy's taking the lucky little girl to her favorite toy store. I found this paper in my stash that I thought might look cool, but unfortunately can't recall who made it or what it is called (my leftover pieces don't have the name of it... it's probably buried on the card! Note to self: write down the make of the paper BEFORE gluing it down) Doh! I layered the background on dark brown Bazzil cardstock, ran a zig zag stitch around it, and popped it up on foam dimensionals. Then the computer-generated sentiment was punched and added. Tilda's Daddy was attached flat to the back too. Then I popped Tilda herself up on foam to create the illusion of depth. 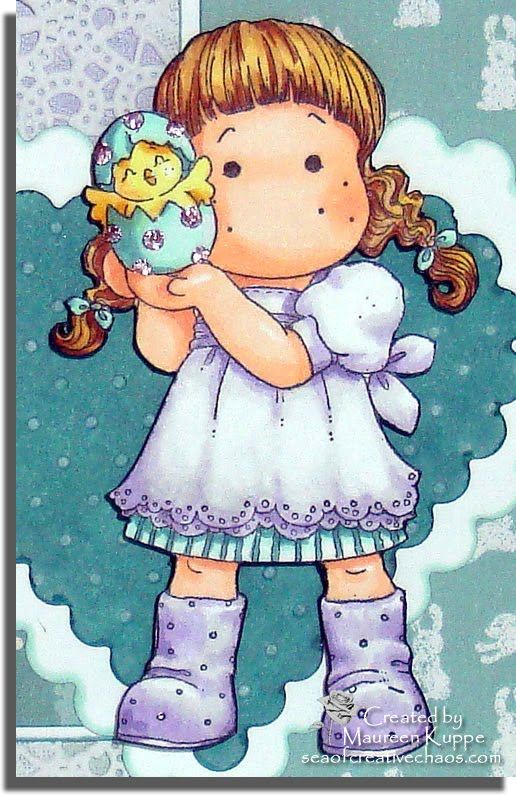 I used my Copics to colour everything of course; and also on the (formerly) white ribbon to match Tilda's dress as well as the (formerly) white flowers. 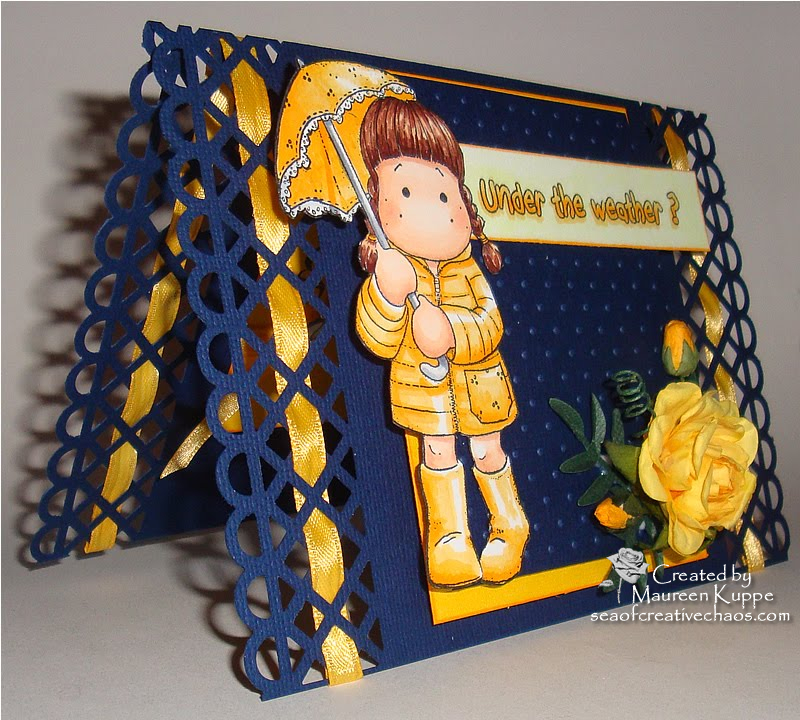 A few dark pearls kept this easel card fairly simple. I hope you like it; it is so much fun to alter these images to create a whole new scene for them! Back to my good old Maggies! 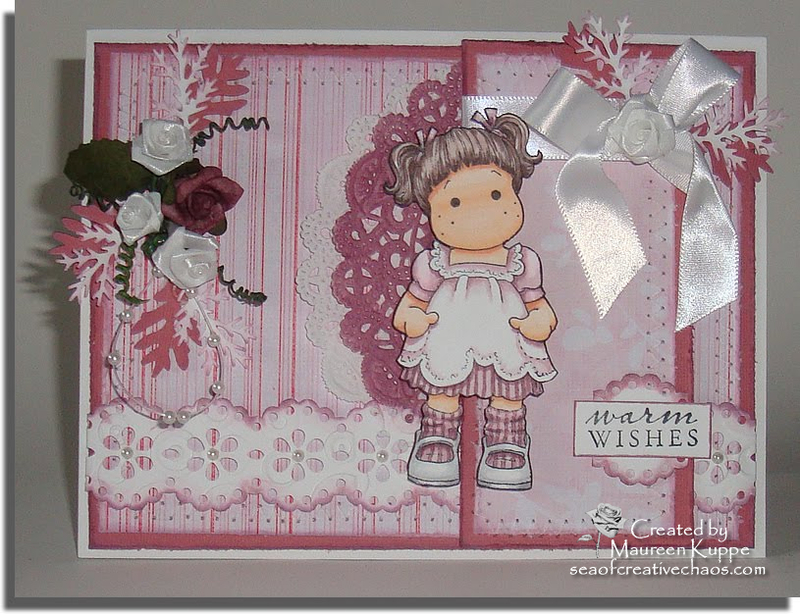 Yesterday in between some housework, I was able to put together a very pink card for Sweet Tilda. 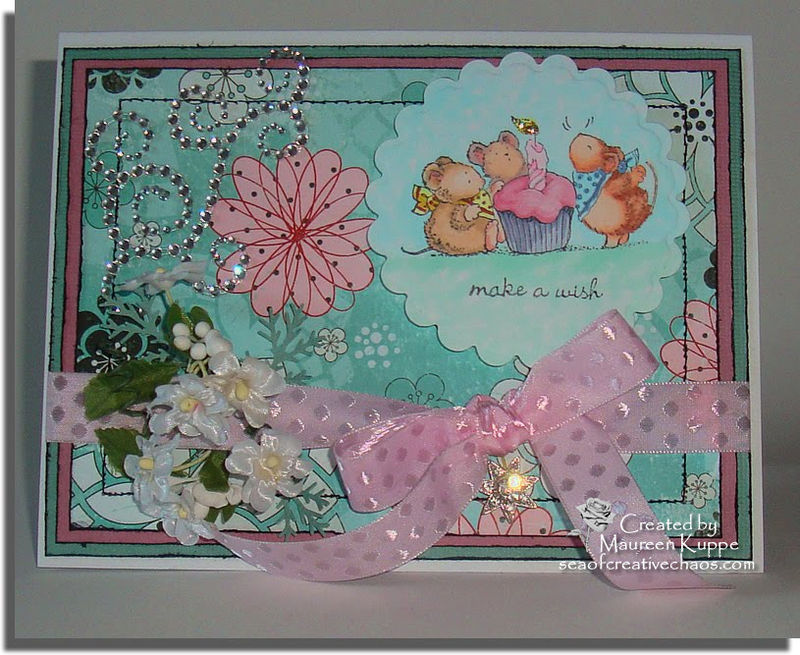 I used some more of my GCD Studios Rose Colored Glasses Collection "Soft Vines" and "Light Stripe" paper, inked, distressed and sewed onto Bazzil cardstock for the background layers. I then used my new Martha Stewart Doily Lace double edge punch for the strip at the bottom, inked and embossed on my Cuttlebug. I added a few pearls to this for a touch of bling. 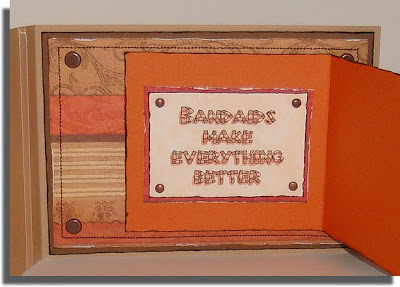 I also used the punch for the sentiment base. I wanted to use a doily (I have a pack of 30 Wilton doilies... gotta use them!) but the colour isn't true white; so I took my Copic RV95 to one side and coloured it in. I then cut it in half and used the white half under the coloured half for more layering. Speaking of Martha Stewart punches, I am amassing quite the collection, what with 40 and 50% off coupons and a few recent giftcards I've received for Micheals. I have 11 small and 1 large single punches and 10 edgers (4 large, 6 small). So I used two more on this card; my Pine Branch in white and inked, and my new Oak Leaf, also inked. The flowers are from Walmart, except for the larger rose which I got in the Bridal section of Micheals... I just used good old Copic RV95 again to colour it to match. The pearl spray is also from the Bridal section; they come in a pack of 18 by Modern Romance. 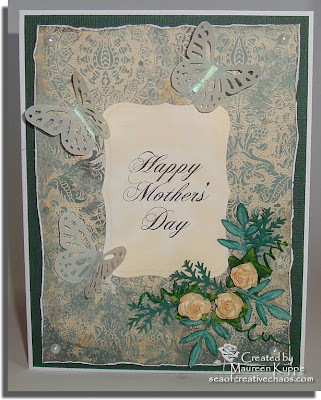 Unsure whether I'll get another card done on this holiday Monday; yes if it rains, no if it doesn't as I really should be outside cleaning the yard. 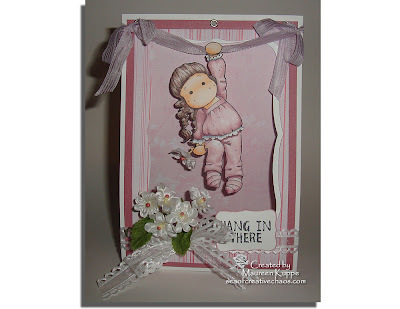 Departing (temporarily, mind you) from Magnolias, I created this card for daughter's 19th birthday yesterday. 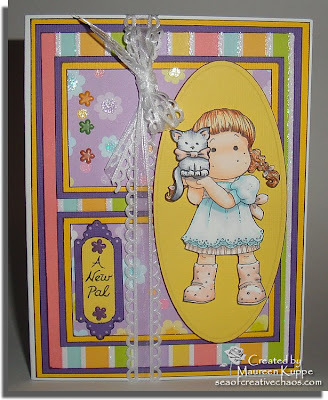 I used the uber-cute Penny Black Micey stamp, coloured with Copics natch, and used my Cuttlebug with Spellbinder die to cut it out and popped it up on foam dimensionals. A final drop of gold stickles added sparkle to the candle flame. The patterned paper is Bo Bunny's Back to Backs. I mounted it on two layers of Bazzil cardstock; all three layers having been inked in black and distressed with my Making Memories distressing tool. I then ran them through my sewing machine for a stitched edge. I wrapped a bow around the paper, added a rhinestone charm and even more bling with a self-adhesive swirl by Basic Grey. 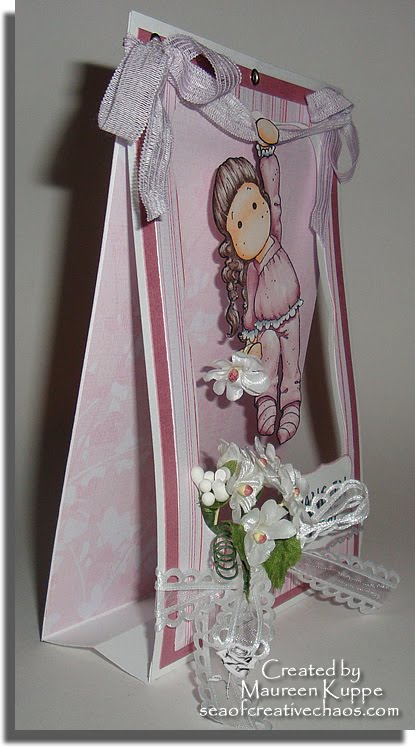 A few white flowers tucked into the ribbon finished it off! For awhile there I thought I would never finish on time. But I did! Last night I completed the final card and attached each one to their own frame; using the Scor-Tape to securely adhere them to the front of the glass frames so the cards can be opened. Tomorrow morning I hand it in and my fingers are crossed that it will pass the approval process; if so, it will be on exhibit in the hospital art gallery from June to September along with about 50 other pieces created by medical staff. A more fitting title it could not be, for I hung in there and got THE LAST ONE DONE!!!! Of course I had to make a tent card to hang Tilda properly. I made the base out of plain white cardstock, then used my Cuttlebug to cut the opening and sentiment with Spellbinders dies. 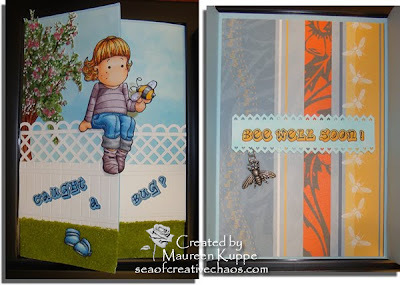 The patterned paper is GCD Studios Rose Colored Glasses Collection "Soft Vines" and "Light Stripe". The flowers I purchased at Walmart, and I coloured the centers to match the paper and Tilda. The ribbon is years old, from Michaels. The top is held together with three silver grommets, two of which I threaded the ribbon through. I always stamp Tilda or Edwin a few times to try out different colour schemes. 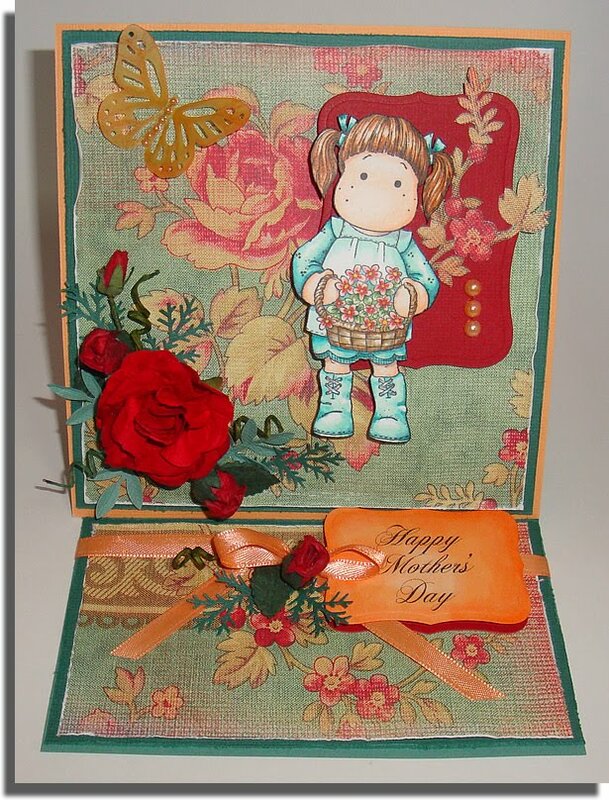 This time I cut off her hands on the second stamp, coloured them in, and used them to layer her hands, making it look more realistic when holding the ribbon and flower. Tomorrow: The unveiling of the finished framed collage! 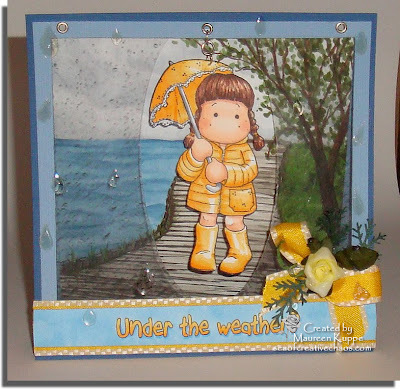 Because I am getting short on time and my first "Under the Weather" tent card was too big for the frame I am using for this art project, I created "Under The Weather 2" (catchy title, eh? I should get a job in Hollywood). Actually, that first card was originally "Rain Rain Go Away". Then I thought I could use it for my "Healing" art project so I covered that saying with an "Under the Weather" sentiment. 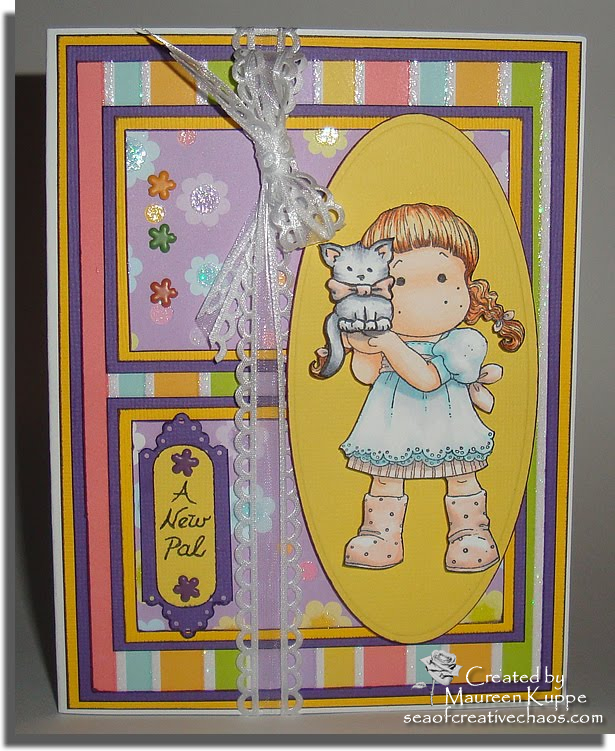 But it still didn't look right with the other cards in my collage, so I re-used the Tilda the old card and made a new landscape proper-sized card simply from cardstock... no patterned paper on this one! My Cuttlebug was used for the texture behind her, and my Martha Stewart lattice punch was run down both sides of the card so I could thread ribbon through it. 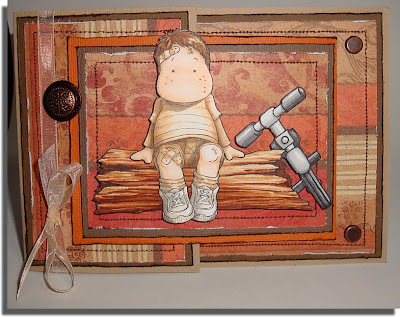 I can't take credit for this idea; I saw a beautiful card on SplitcoastStampers and just had to try it out. Then I had a problem. No deep yellow ribbon. Drat. So I got out my trusty Copics and with a swipe, had the perfect match! Yay! 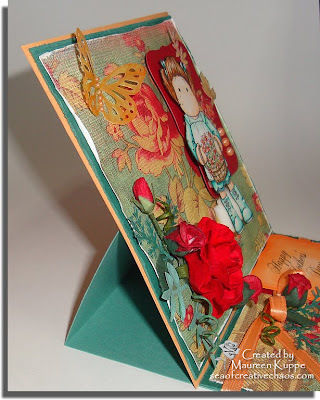 I raised each of the background mats on foam dimensionals, added a few Dollar Store roses, and viola! 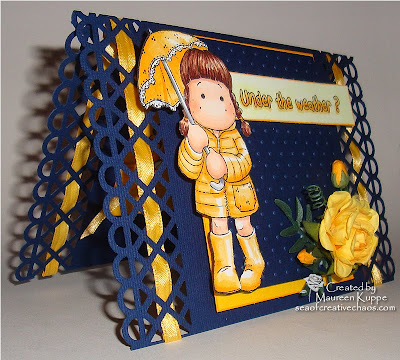 A card made in one evening. On the inside I finally used my Get Well stamp, more ribbon and an umbrella brad I had bought but never used on, my original Under the Weather card. I hope to finish up my last card tonight so I can hand this in for judging Thursday, because I also have a card to make for my daughter's birthday Friday! Yikes! 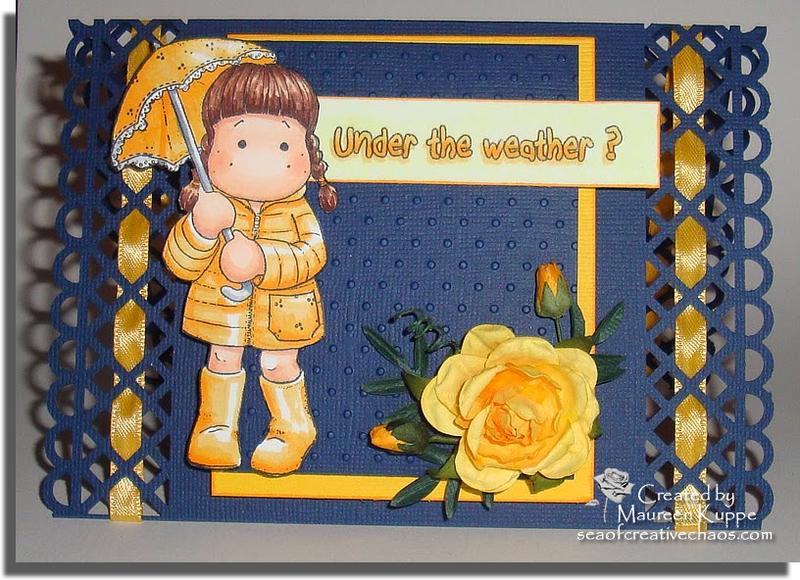 Well, at least after all that, this long weekend I can make a replacement Tilda with Umbrella for my original Under the Weather card (or, as I like to think of it now, "Classic Under the Weather"). 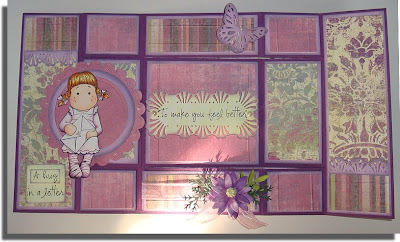 This next card made for my "Healing" art project used Tilda with Letter. While searching for greeting card sentiments, I came across "A hug in a letter to make you feel better." Well, what a perfect match! So I began the card; this time I needed one with purples in it. 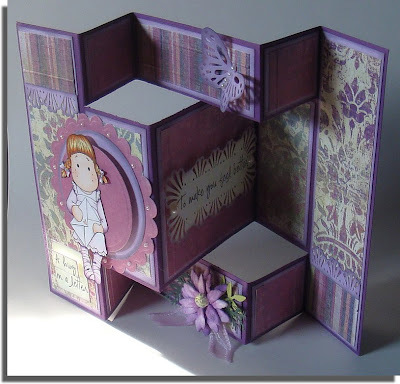 I found a tutorial to make this Tri-Fold Shutter Card at SplitCoast Stampers so I decided to give it a try. After doing a bazillion cuts and folds (okay, so I exaggerate; it was only a million or so) I finally got the thing put together, but not before my cat Dakotah knocked it around a few times, causing much swearing on my behalf. The paper I used was My Mind's Eye Street Market Carefree "Graceful" Elegant Print / Poised Purple Paper (# 291048). I used Bazzil Basics Bouquet and Purple Palisades which was inked using ColorBox chalk ink. I wrapped a ribbon around the middle bottom panel and added an old pressed purple paper flower I had picked up at an art store going out of business years ago. I re-painted the center, and added some Copics for highlights and shadows (Y000 and V12). 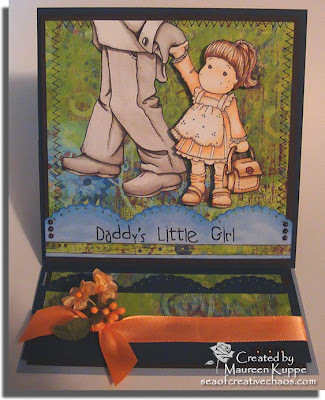 The sentiments were printed off and coloured with Y000. Four Martha Stewart punches were used: The butterfly, deco fan, branch and leaves punches. My Cuttlebug was used with Spellbinders round and scalloped round dies for behind Tilda, raised on foam for some dimension. Finally, a few pearls were added for a touch of bling. THANK YOU SO MUCH FOR ALL THE WONDERFUL SUGGESTIONS AND COMMENTS ON MY LAST CARD. 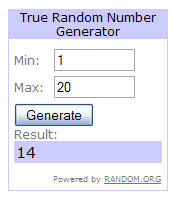 I WILL MAKE THE DRAW AND DECISION FOR THE WINNERS ON MONDAY SO YOU STILL HAVE TIME TO ENTER IF YOU WISH! 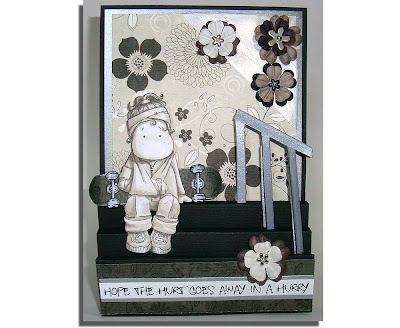 This is another card for my hospital "Healing" art project. This time I made a Joy Fold Card (I have no idea why it is called that, but it was my first one). I wanted to create a scene that put this typical scraped-knee boy in a situation that perhaps explains his latest scars... biking in the woods. I hand-drew the log and then struggled on how to do his bike. But then I remembered that Edwin already HAD a bike (in another stamp)! So I used that one as a model for the bike I drew leaning on the fallen log. Edwin, the log and the bike are all coloured with Copics, natch. They are also popped up on foam dimensionals. 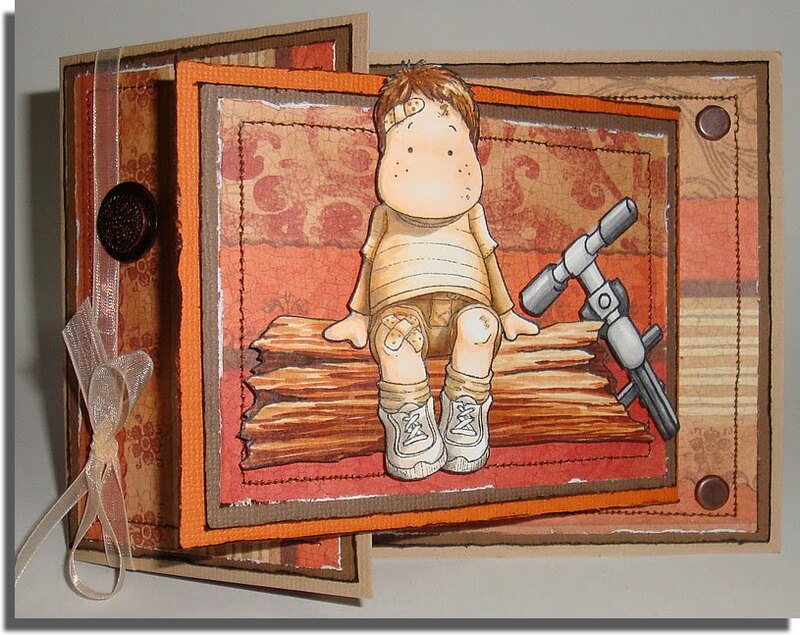 The paper used was K&Company Tim Coffey Fall Rust Stripe. Both the patterned paper and Bazzil cardstock were inked with Tim Holtz Walnut Stain Distress Ink and then while still wet, my Making Memories distressing tool was run down the edges (I had forgotten how good that thing works!) I used my sewing machine to do some stitching on three of the panels. The brad closure was a tad small, so I found a washer to go behind it. 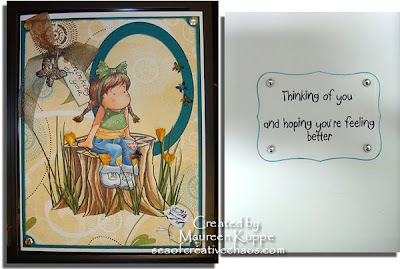 Since they were both a pewter colour, I used Copics to colour them to match the other coppery metals on the card. 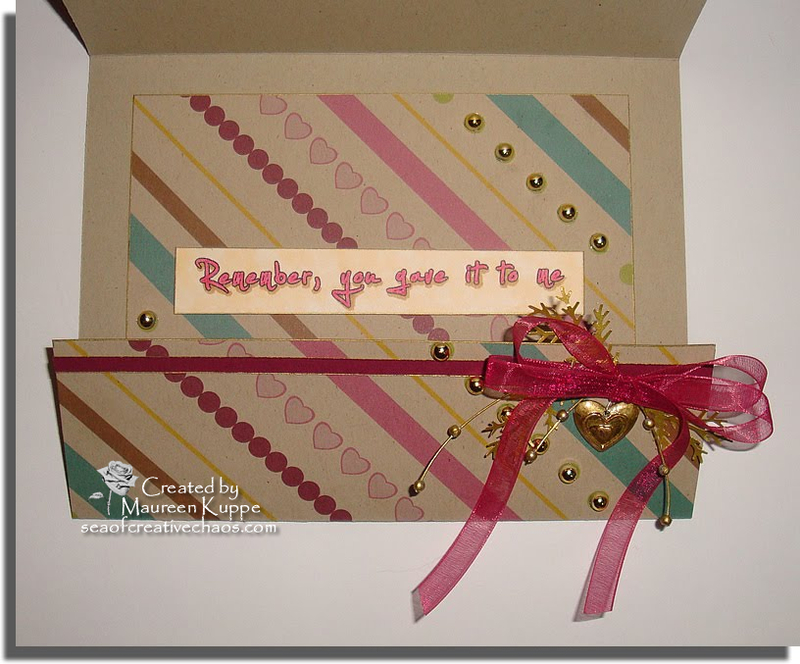 A sheer beige ribbon finished off the front of the card. I think. I may add something more to it after I ponder it a few days... it wouldn't be the first time I did this. But here is where I need YOUR help! I don't know what sentiment I should put inside. All I can think of is "Take care of your Boo Boo". I know. Lame. I am certain you clever people can come up with something much better! So please, add your suggestion in the comments! I would be forever grateful!!!! And just to be fair, I shall also choose another commenter randomly to receive a special surprise by mail too. So put on those thinking caps - because mine, obviously, is defective. Thank you Dawn from Creativity With Dawn and thank you for a perfect saying! As you can see, I even found a free "Bandaid" font to print it out in! 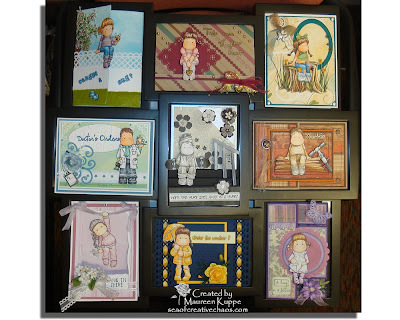 Cabio of Cabio's Craft Corner! Thank you for your wonderful comments. Congrats to both of you! Please email me your mailing addresses so I can send you each something I hope you will like. And thank you to everyone for your very kind comments. Well I got another Get Well card made for my hospital "Healing" art project. Looks like poor Tilda needs more practice. I started out with a base of 4.5" by 12" Bazzil Blackbird cardstock, scored it at 1.25, 1.5, 2.75, 4.5, 4,75, 6.5, 8.75, 9 and 11.25 inches and folded it for the stairs. At the back, I attached a seperate piece of cardstock measuring 4.5 by 6.5 inches for the background papers to attach to. The background paper and matching patterned paper on the step and skateboard are both the same two-sided BoBunny Unforgettable #12U963 paper. Since this paper is all neutrals (grays and beiges), I coloured Tilda in neutrals only too. 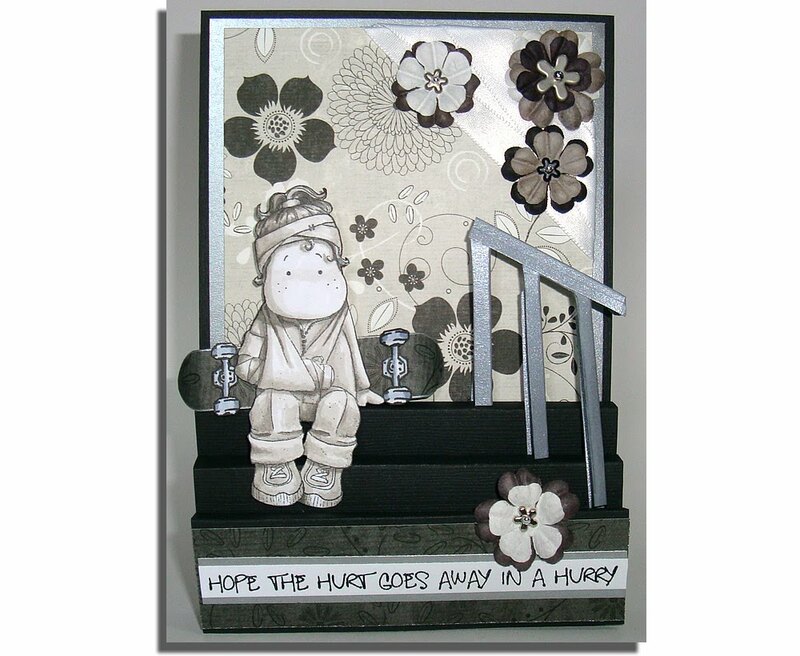 Silver paper was used behind the background paper and sentiment. The skateboard is a piece of patterned paper using my corner rounders and curled with my scissors at each end to make the curves. I outlined the board with silver ink to mimic a metal edge. I drew the wheels, coloured them in with Copics and glued them to the skateboard. To keep the shape of the board, I attached it to the card using a double height of foam dimensionals. The hardest part of the card was that railing. It took two test models to come up with the proper cuts and scores to create it in 3D. 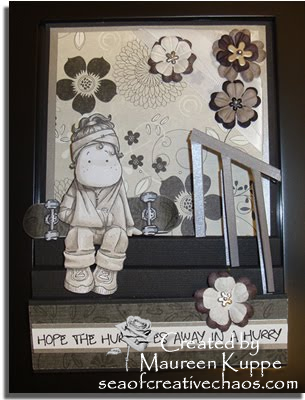 I used heavy silver cardstock and attached it using my ScoreTape inbetween the steps. Here's hoping Tilda doesn't try that trick again. 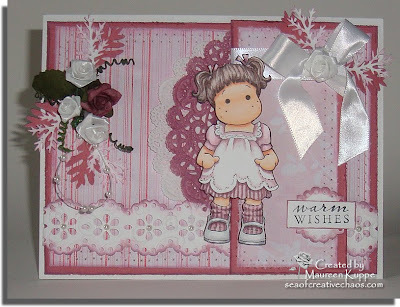 I used Tilda with Flowers coloured with Copics, of course. This is the first time I've used my new Georgia Pacific paper that I bought on our recent trip to the States. I must say it colours so well. Good thing I bought a few packages! The paper used for the background is Daisy D's Heirloom Blue - Attic stripe #13918. Flowers are Dollar Store versions coloured with Copics. 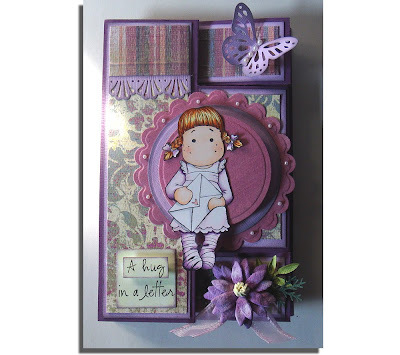 The butterfly is punched from peachy vellum using the Martha Stewart butterfly punch and highlighted with Copics as well as having Copic-coloured pearls added to the body and head. Tilda and the sentiment are raised on foam dimensionals; her legs doubly-high as the red background is also raised as you can see from this side view. The leaves and branches are punched using Martha Stewart punches as well. 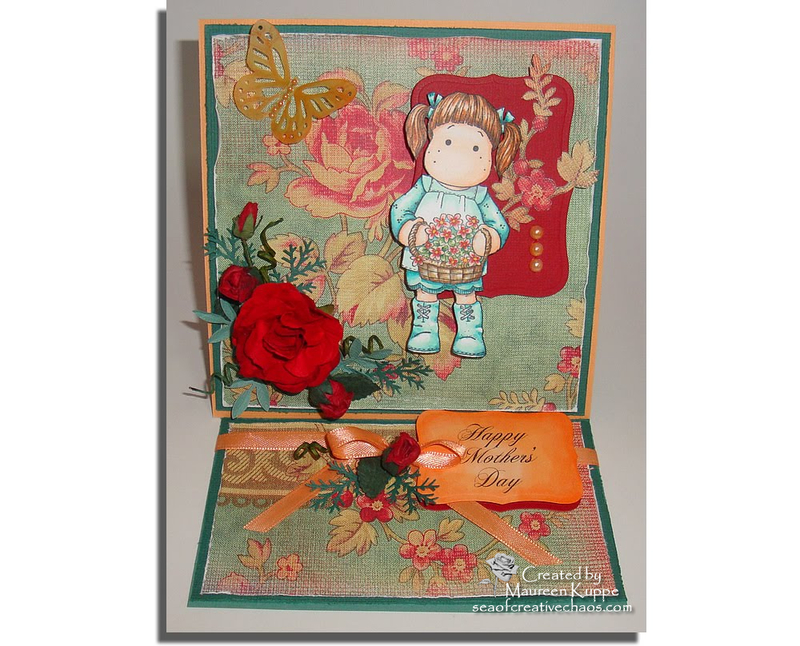 Here is the card I made for my Mother In Law. 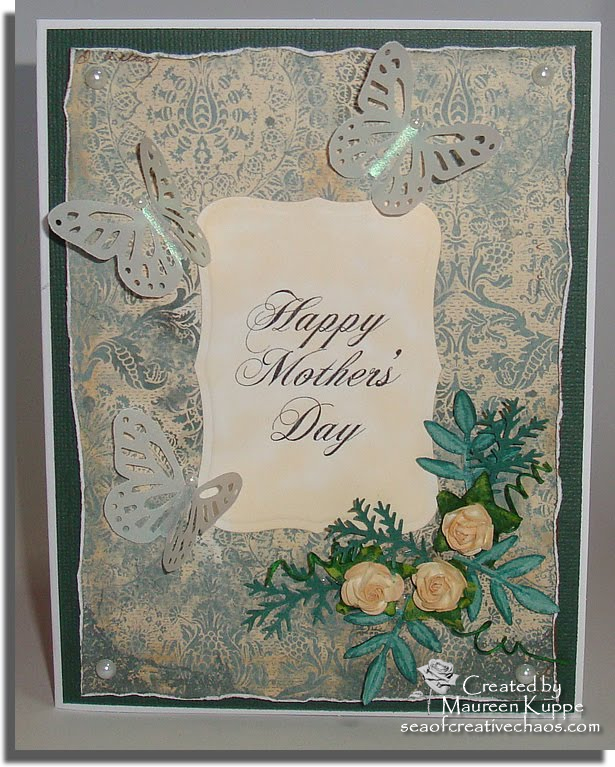 No Maggies on this one, just a simple card with Prima roses and more Martha Stewart butterflies; this time punched from a shimmery vellum. Pearls again were used, this time not coloured. The sentiment was coloured with E50. Background paper for this card is TPC Studio's Ancestral Teal Brocade. For all those Mothers out there: Happy Mother's Day! 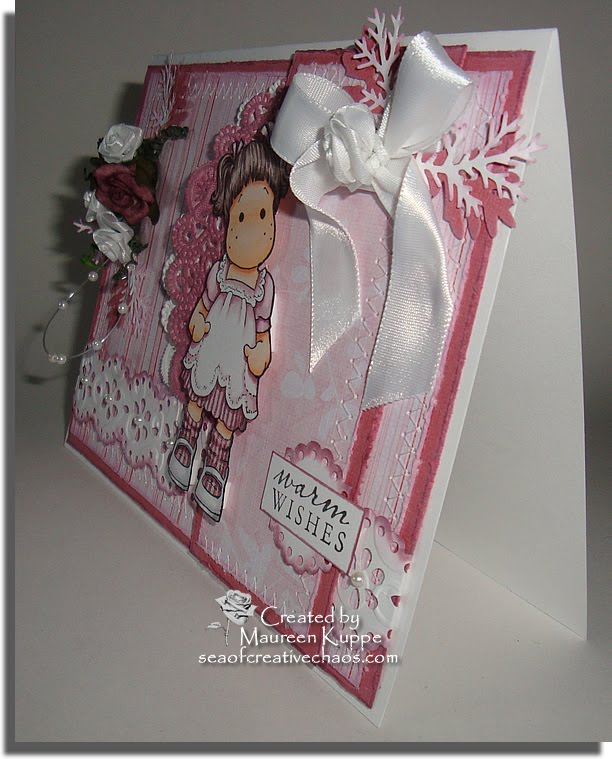 I hope to spend the day making more cards!!! My third card for the hospital Get Well Card project: this time Cardiac-related as I do work in Cardiac Sciences. 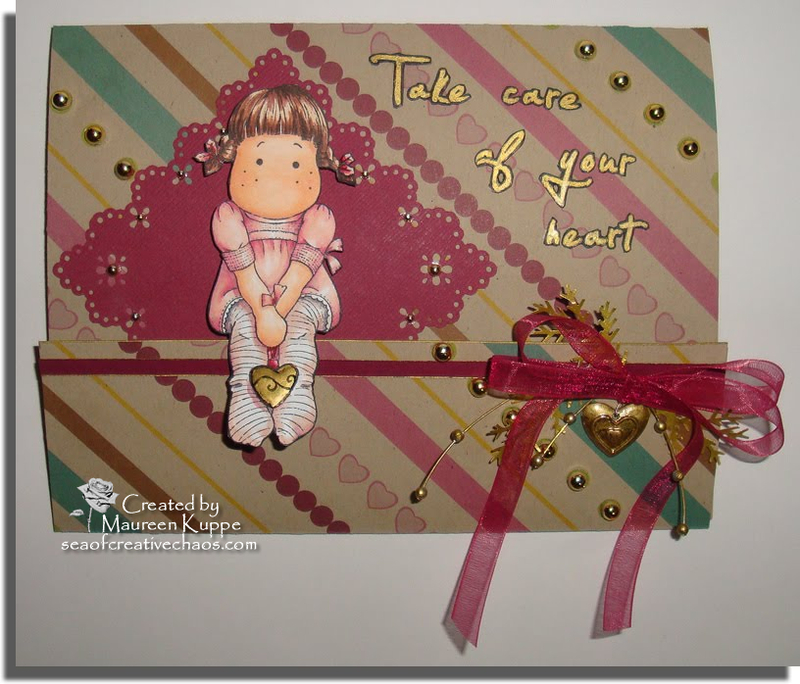 Tilda with Heart Ornament was used for this one, coloured with Copics except for the heart which was filled in with a Freixenet gold paint marker. Since the marker is opaque, I had to re-draw the heart's original design on the front with black Copic Multiliner. 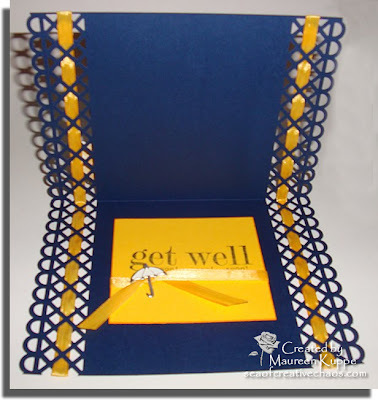 The Martha Stewart Eyelet Lace punch was used for the background cardstock. 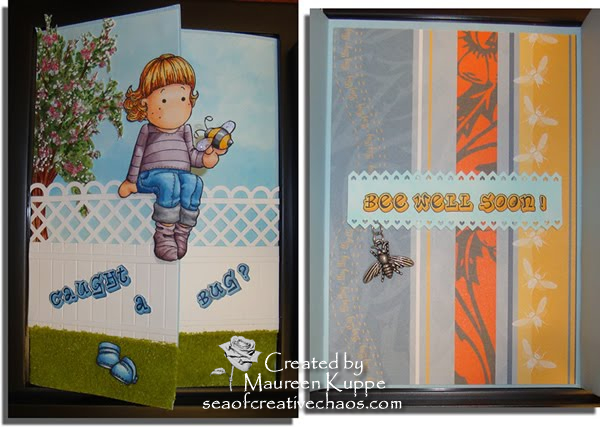 The patterned paper is Kraft Kuts Striped Girl by Fancy Pants Designs and both are highlighted with self-adhesive gold pearls of various sizes. I found a heart charm, but it was silver so I had to change it to gold with the marker too. I also used it on the pearl sprays that were formerly white. The sentiment was run off on my computer, filled in with the gold marker, then cut out. The Martha Stewart branch punch was used on gold paper and inserted behind the ribbon bow, along with the gold pearl sprays. Inside the bottom flap (not pictured), are two rows of lacey layers in gold and burgundy. 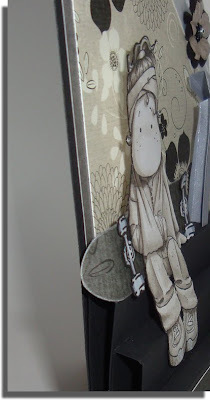 Tilda is popped up on dimensional foam and reinforced behind her legs with a strip of flat plastic so she doesn't tear when the card is opened and closed. I have re-purposed a card I made a few weeks back: "My Rain, Rain, Go Away" card has been transformed into an "Under the weather?" 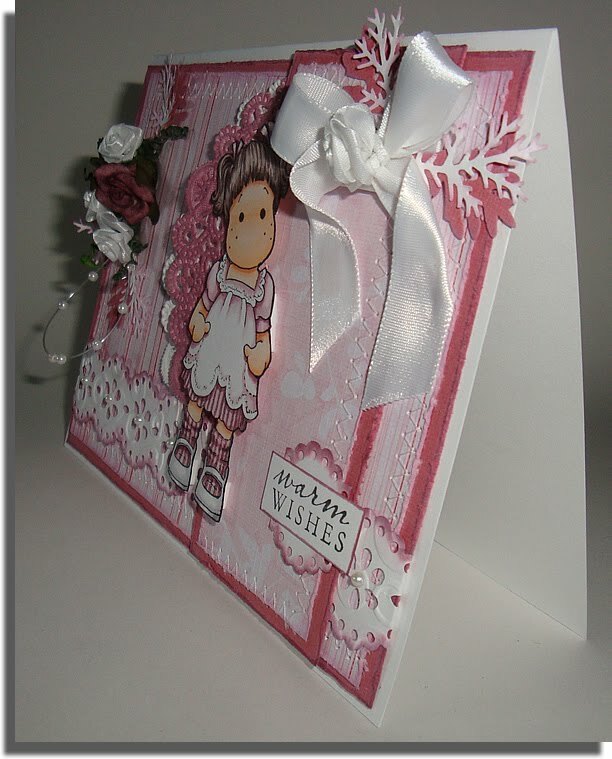 card with the simple addition of a ribbon-backed sentiment. So far I have four of nine cards done. But I am now down to less than two weeks before this is due.... yikes!